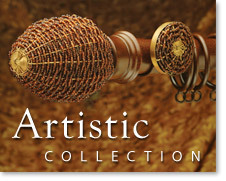 The Artistic Collection consists of eleven fabulous iron finials, each available in 8 different colours, along with matching 1 1/8 inch thick iron curtain rods, iron brackets, hold backs, elbows, hooks and curtain rings. 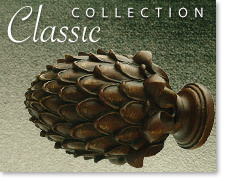 The Classics Collection consists of eleven fabulous iron finials, each available in eight different colours, along with matching iron curtain rods, iron brackets, hold backs, elbows, hooks and rings. 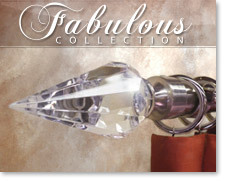 In this collection you will find stunning white drapery rods and finials. 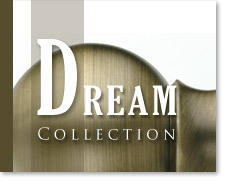 The Dream Collection consists of eleven fabulous iron finials, each available in eight different colours, along with matching iron curtain rods, iron brackets, hold backs, elbows, hooks and rings. 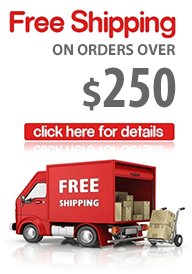 In this collection you will find stunning white drapery rods and finials. 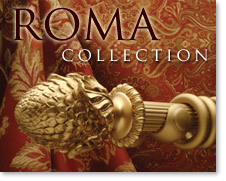 The Roma Collection consists of eleven fabulous iron finials, each available in 8 different colours, along with matching iron curtain rods, iron brackets, hold backs, elbows, hooks and rings. The Timeless Collection consists of eleven fabulous iron finials, each available in eight different colours, along with matching iron curtain rods, iron brackets, hold backs, elbows, hooks and rings. 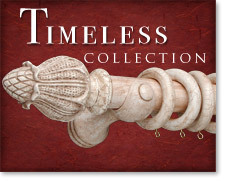 In this collection you will find stunning white drapery rods and finials. 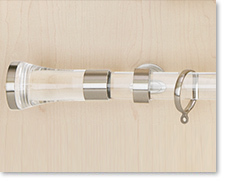 If you are looking for luxurious and modern drapery hardware then you will love our Lux Acrylic Collection. It's classy, it's elegant and it comes in 5 finishes: antique pewter, black chrome, black, brass and mirror chrome. This collection also has passing rings and passing brackets for added functionality and style.